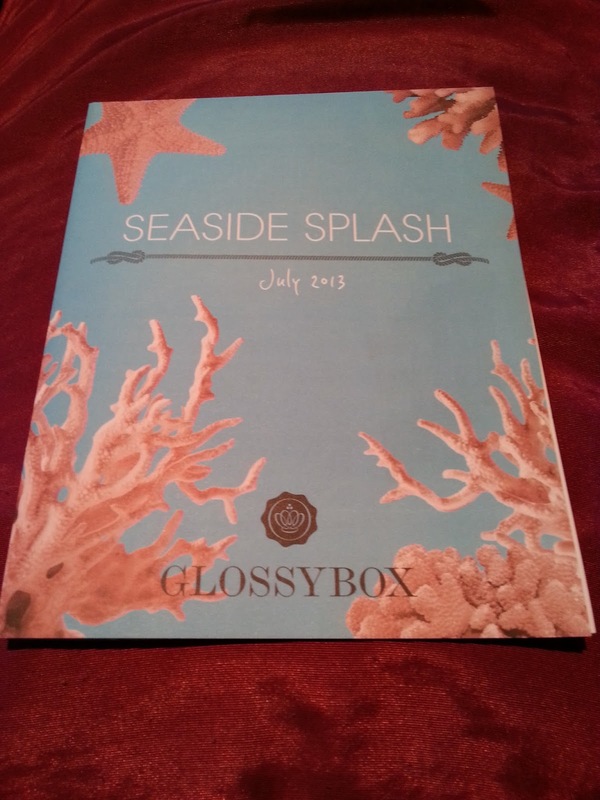 Ah Glossybox, we had fond memories. You were the very first monthly beauty box I ever subscribed to. It all started out so rosy, a blossoming relationship filled with wonderment and surprise. And how you surprised me. 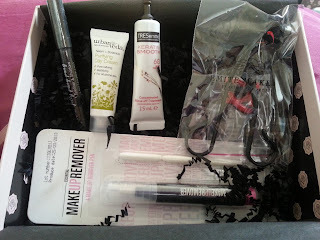 Every month was like a Birthday treat, I eagerly awaited the arrival of my postman to bring me my box of prettiness filled with luxury samples and even full sized goodies. I so looked forward to the unwrapping of the delightfully presented treasure trove box of beauty booty. The anticipation, the glee, the surprise, the astonishment, the thrill of finding out what goodies would be in store for me. Unfortunately, like many new relationships, eventually the fizzle dissipated. The chemistry wasn't working. I just wasn't feeling it anymore. At times I was left feeling disappointed and confused. Toothpaste? Lipcote? Anti-Wrinkle cream? Yardley perfume samples? At times, I felt they didn't even know me anymore. Worse yet was when I saw the luxury gifts heaped upon others - Dermalogica samples, HD Brows kits, Sleek palettes... Where was I going wrong? Was I unloved? Why wasn't I being lavished with these gifts from the Gods? 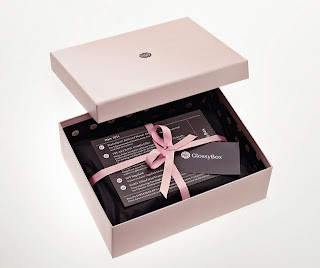 Of course, you must realise that a lot of these monthly beauty boxes depends on the luck of the draw, but at times I felt I was getting the short straw and so it was that I ended our relationship. Now don't get me wrong, there were many times I fretted - did I make the right decision? Would they take me back now if I changed my mind? And then of course, worse was to come when I saw fabulous boxes filled with treasures galore and I missed the monthly thrill, the surprise, the anticipation, the sheer fun of it all. I stayed strong however, and did not succumb to temptation. 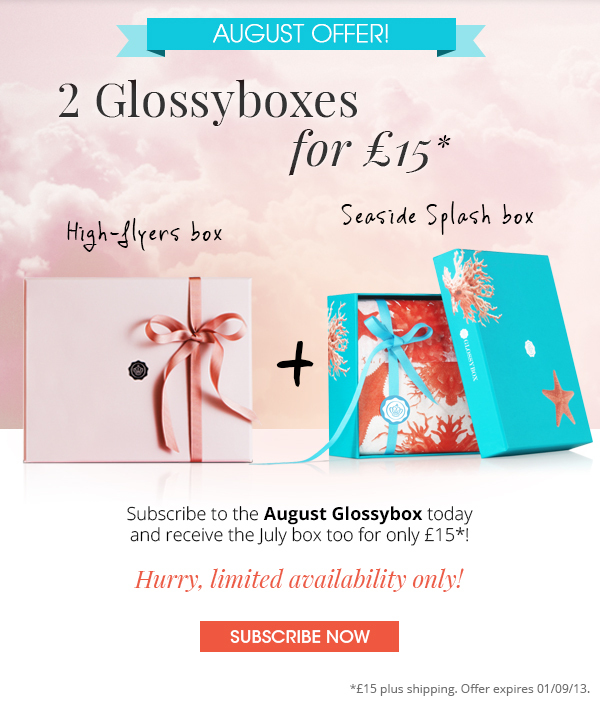 That is until I recently received an email informing me that I could avail of August AND July's boxes for just £15. After a bit of research, I found out that the High Flyers and Seaside Splash boxes really clicked with me. In addition to this, I was also very interested to read that Irish beauty, Rachel Kavanagh - you may remember her from Fair City - who previously brought us the incredible Rockstar Tan has recently become the new CEO of Glossybox UK and Ireland. 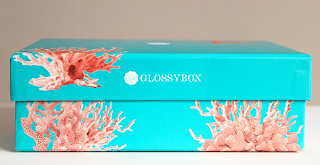 I absolutely love this packaging - a gorgeous aqua marine shade with coral reef. Stunning. 'Pout Paints are intensive, long lasting lip pigments that are made to be mixed. Use a tiny bead of Pout Paint and smooth onto your lips for mind-blowing vibrant colour that gives you full coverage that lasts for hours and dries to a satin finish. Did you receive electric blue or bright silver? Don't worry they're meant for mixing. Simply use to brighten or add vibrancy to your regular colour, and create your own unique shade. 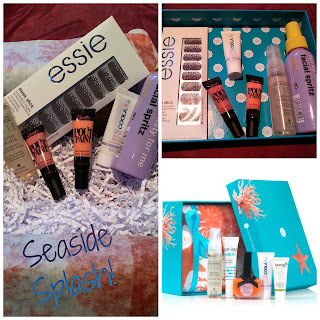 'Your perfect "Seaside Splash" summer companion! Forget perfectly primped hair, and instead opt for effortlessly tousled, "just-back-from-the-beach" waves with this weightless mist. Adds texture, volume and healthy shine to all hair types." I was absolutely delighted with this Glossybox. Being a huge fan of OCC's Lip Tars I had my eyes on the Sleek Pout Paints for quite some time, however given that Sleek can be hard to get hold of here in Ireland I had yet to try them, so I was thrilled to find not one, but two Pout Paints included. I received Minx and Peachy Keen. Overall, I was extremely pleased with the Seaside Splash offerings. 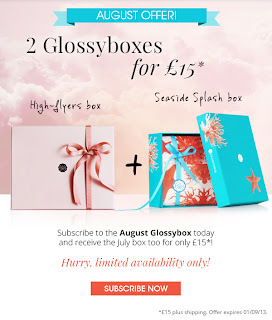 My box's value totaled over £35 - the box itself set me back just £7.50 so it represents fantastic value for me. Most importantly however, everything included is something I will use - there's no point totting up how much money you've saved if you're not actually going to use the products! Next up is August's offering - The High Flyers edition. Targeted for girls on the go, jet setters and travelistas. This months box features brands from all over the globe. 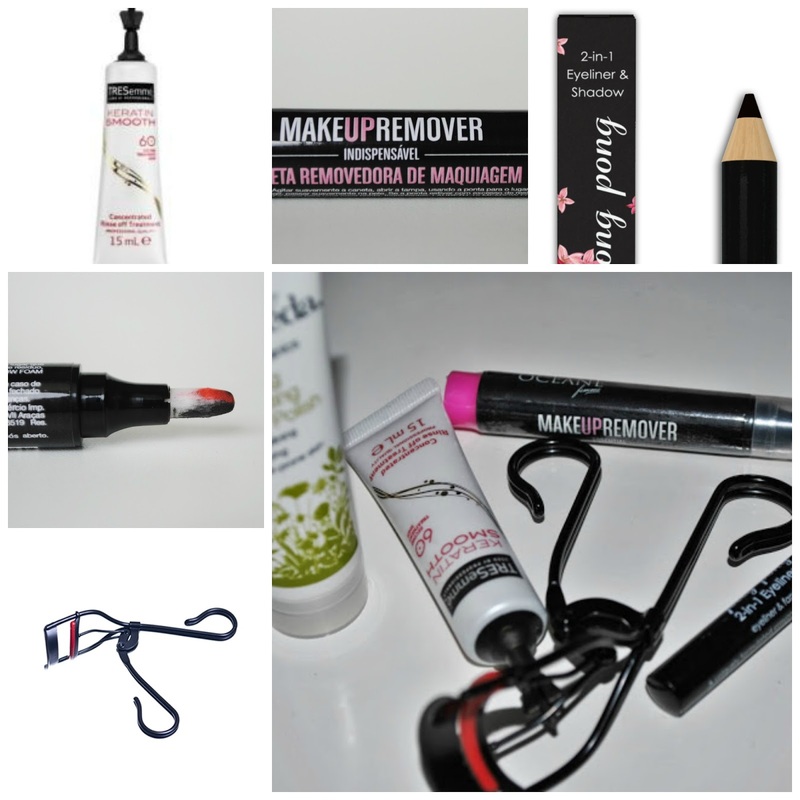 "This pen delivers a mobile, mess and fuss free makeup touch-up/removal solution." This has a special curved design to suit all eye shapes without touching your makeup base. "This creamy crayon can be used to line the eye as well as smudged and blended as a shadow." "In sixty seconds will transform frizzy, fried hair into beach goddess worthy hair." "Ayurvedic detoxifying botanicals to keep complexions clear." Again, the contents of this edition are valued at just over £35 - not bad considering I paid just £7.50 for it.